Bobby Mancini has promised his Man City side will beat Man Utd in the League Cup semi final, then go on to win the trophy, thereby forcing United fans to take down the mocking ‘clock’ banner on the Stretford End, which constantly reminds City fans how long it is since they last won silverware (1976). 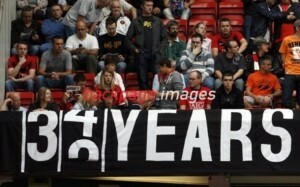 “When we go to Old Trafford we will take that banner down. This is the last year it will be up because we will win, for sure. “I am well aware how long it is since City last won a trophy, but this season we have a great opportunity to put that right. He will take that banner down, eh. Fighting talk from the dashing Italian, who is newly arrived in the north-west and currently living out of a Manchester hotel. Win the title first and than talk.